In October of 2005 I wrote on this web site about my pursuit of information about the elusive Chanco Lodge chenille prototype patch. 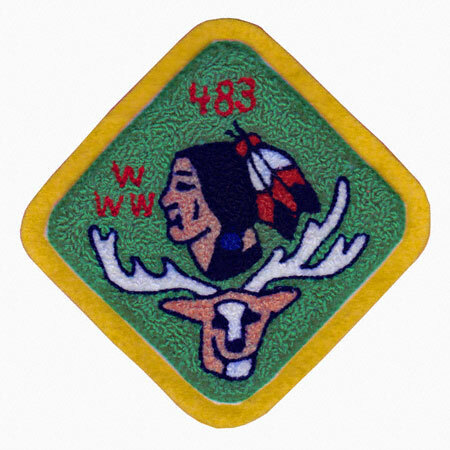 My multiyear search for this previously mythical patch finally struck gold when I asked longtime Chanco Lodge member DeWitt Holland about it. Not only did DeWitt know of it, he designed it, ordered it, and had the only known example of it. DeWitt provided me with color photos of the front and reverse of the chenille, along with a copy of the original order form sent to Standard Pennant Company of Big Run, PA, as well as the order confirmation from SPC dated 10/28/93. 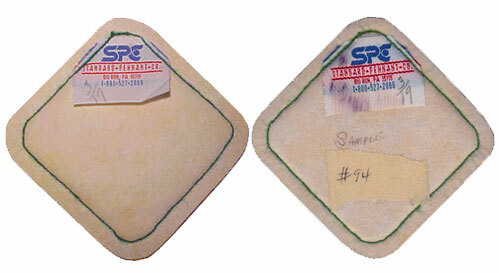 Both documents indicate a quantity of one patch. It was voted down as being too expensive to produce and the majority of the members thought it was just a fund raiser. It's cost would have been $30.00 each and the lodge had never produced anything that cost anywhere near that much. Fast forward to March, 2010. Collector John Ortt of Virginia Beach (who you may recognize as organizer of the annual Williamsburg Trade-O-Ree) acquires a Chanco YC1 prototype from fellow Virginia collector Josh Batten, only to discover it's not the one from DeWitt's collection pictured on this web site. Comparing the reverse of the two patches reveals differing labels, though both share the same handwritten operator number: 3/19. DeWitt's YC1 has a clean felt back while John's has the word "Sample" written in ink in the center and a strip of masking tape marked "#94." Standard Pennant apparently ALWAYS makes a sample for their own archival purposes whenever they have a new patch order. My patch is actually the sample from the company. A similar file sample from SPC led to the discovery last fall of a previously unknown prototype C-3 chenille patch for Kecoughtan Lodge. That patch was purchased from SPC in a lot of samples by Conley Williams in 1995. No word yet on whether the 483 YC1 chenille prototype sample was part of that group. You may wonder if John was disappointed with the new addition to his collection after learning it wasn't the only one in existence. "I'm still very happy with the patch; no problem with it being a sample and the SECOND one known," he says. Personally, I am grateful to know that the second 483YC1 is in the hands of someone who recognizes the special nature and history of this item and that it is staying in Virginia. That's a much more rightful place than a file cabinet in Pennsylvania! The scarcest patch issued by Kecoughtan Lodge is the acorn shaped felt X1 issued in 1954 for the National Order of the Arrow Conference. If you'd like to add this to your collection it's listed right now on ebay, with a minimum bid of $12,000. The seller is Josh Batten, a Virginia OA collector who is also offering a number of other exceptionally rare OA items for sale. 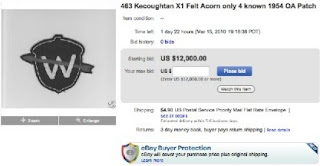 Only four of the Kecoughtan X1 are known to exist. According to Sam Fairchild, seven were made, three have been lost forever. I have never seen one offered for trade or sale in four decades of collecting and oaimages.com has no record of any prior 463 X1 sale, so it's probably not an exaggeration to say this is a once in a lifetime opportunity to acquire one. Josh kindly provided a picture of the 463X1. 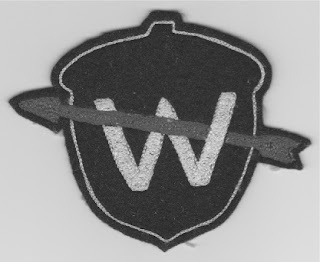 The picture of the patch is grayscale to prevent counterfeiting (as agreed to by the four owners of the known existing examples of this item).